After Christmas Day has been celebrated in most Latin-American countries, México, and Spain, the real day for exchanging and receiving gifts falls on Jan. 6, known as El Día de los Reyes or Day of the Three Kings. This day honors the three wise kings: Baltazar, Gaspar and Melchor representing Europe, Arabia and Africa, who traveled from far away places, bringing gifts of gold, frankincense and myrrh to the newborn Jesus in recognition of his Divine nature. One of the events held is a special feast when families indulge in the Rosca de Reyes — wreath of the kings — which is an oval shaped sweet bread symbolizing the crown of a king, richly adorned with dried candy and jewels representing what kings normally possess. Inside is a small hidden doll representing baby Jesus that alludes to the hardships Jesus suffered under Herod, then king of Jerusalem who, via mystical signs, had been informed that a new king had been born. After the feast is over, whoever gets the doll gets to host a party during the Día de la Candelaria in February, officially ending the festivities. El Día de los Reyes normally ends that evening with tamales accompanied with some hot chocolate. This activity is the norm in many Latin-American countries from Spain to the New World and was later brought to New Spain and is practiced in South Texas. However, as this region became part of the United States of America, and in large Latino communities across this nation, some modifications of this El Día de los Reyes became apparent. For example, in New York and in New Jersey with a large Latino population, a massive parade is held to commemorate this event. In Chicago, there is a three kings parade. In New Orleans, it marks the beginning of the Mardi Gras events. 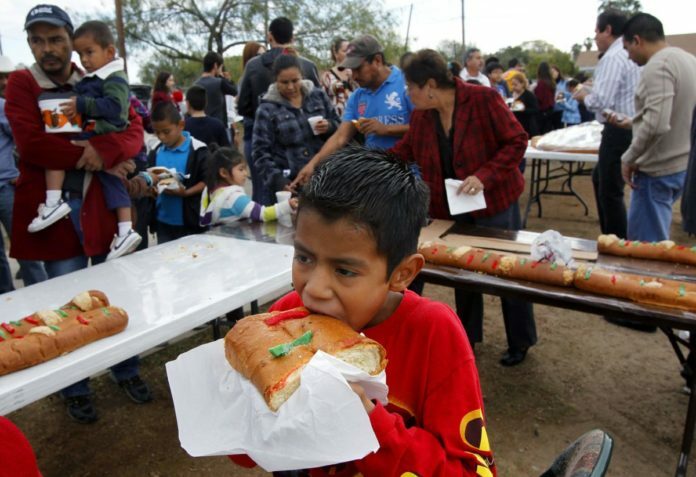 In the Rio Grande Vallley this event is celebrated on a smaller scale, that while this El Día de los Reyes is known and appreciated by local Hispanics, activities such as a feast of enjoying a Rosca de Reyes along with some hot chocolate, and some tamales later on have become a custom among local families. Many bakeries in the Rio Grande Valley bake hundreds of Rosca de Reyes for its faithful customers who flood in to buy and join in solidarity with their next door neighbor Mexico. However, no massive parades nor other activities are usually planned. The mere idea of practicing this solidarity and camaraderie with fellow heritage owners indicates that this tradition, dating back centuries, is still very much alive in the Río Grande Valley. Dr. Lino Garcia Jr. is Professor Emeritus of Spanish Literature at UTRGV, and he can be reached at lino.garciajr@utrgv.edu.